• John Dee (1527-1609), the enigmatic Elizabethan “mathematician, magician, astronomer, astrologer, imperialist, alchemist and spy”, is the subject of an exhibition currently running at the Royal College of Physicians Museum in Regent’s Park. Scholar, courtier, magician: the lost library of John Dee explores his life through remnants of his personal library and features mathematical, astronomical and alchemical texts, many of which he elaborately annotated and even illustrated. The texts are drawn from the collection of the college library which has more than 100 of the doctor’s volumes and which forms the largest collection of Dee’s books in the world. The books represent only a fraction of the more than 3,000 books and 1,000 manuscripts he claimed to own before his library was, so Dee claimed, sold off illicitly by his brother-in-law Nicholas Fromond after he gave them into his care when he travelled to Europe in the 1580s. Many of them apparently fell into the hands of Nicholas Saunder, possibly a former student of Dee’s and later passed into the hands of book collector Henry Pierrepont, the Marquis of Dorchester, whose family gave his entire library to the Royal College of Physicians after his death in 1680. The free exhibition runs until 29th July. For more, see www.rcplondon.ac.uk. 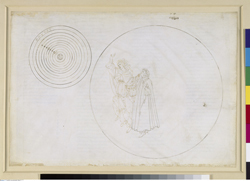 • Botticelli’s drawings for Dante’s epic poem, the Divine Comedy, are at the heart of a new exhibition which opened earlier this month at the Courtauld Gallery in Somerset House. Botticelli and Treasures from the Hamilton Collection, which is being run in collaboration with the Kuperferstichkabinett (Prints and Drawings Museum) in Berlin, features treasures which were sold to Berlin by the 12th Duke of Hamilton in 1882 despite efforts by Queen Victoria to prevent the transaction. They include a selection of 30 of Botticelli’s drawings – which date from about 1480-95 – as well as illuminated manuscripts including the Hamilton Bible. Said to be one of the most important illuminated manuscripts in the world, it is being returned to the UK for the first time since 1882. The exhibition, which coincides with Botticelli Reimagined opening at the V&A next month, runs until 15th May. Admission charge applies. For more, see www.courtauld.ac.uk. PICTURE: Sandro Botticelli – Beatrice explains to Dante the order of the cosmos (Divine Comedy, Paradiso II), around 1481-1495/© Staatliche Museen zu Berlin, Kupferstichkabinett/Philipp Allard. • The stories of women in times of war form the heart of a new display on show at the Imperial War Museum in Lambeth. Eleven Women Facing War features photographs and films taken by award-winning British photographer and film-maker Nick Danziger. He first photographed the 11 women, who all lived in conflict zones, in 2001 for an International Committee of the Red Cross study documenting the needs of women facing war before setting out 10 years later to find each of the women and see what had become of their lives. The exhibition features 33 photographs and 11 short films from conflict zones including Bosnia, Kosovo, Israel, Gaza, Hebron (West Bank), Sierra Leone, Colombia and Argentina. Among the stories told are those of Mah Bibi, a 10-year-old orphan who was begging for food for herself and two brothers when first photographed in Afghanistan and who, 10 years later, had vanished and is believed to have died in 2006. Another is that of Mariatu, who was struggling to rebuild her life in Sierra Leone after her hands had been forcibly amputated by guerrilla soldiers at the age of 13 when she was photographed in 2001 and who 10 years later had moved to Canada. The exhibition runs until 24th April. Admission is free. For more, see www.iwm.org.uk.